We had 1,339 books in our house in the year 2000. I know this because our youngest child counted them. It was partly my attempt to give him a simple chore each day during summer vacation and partly curiosity. I’m sure it’s over 1,500 by now because we keep adding and seldom subtracting books. 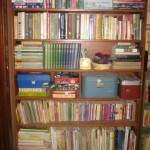 I confess that the picture of the bookcase today does not contain books I am giving away. That’s a much bigger project than I’m up to right now. I did note, however, that I have 13 Bibles. Does anyone need that many? Yes. For my writing I often check different translations plus some are children’s Bibles. 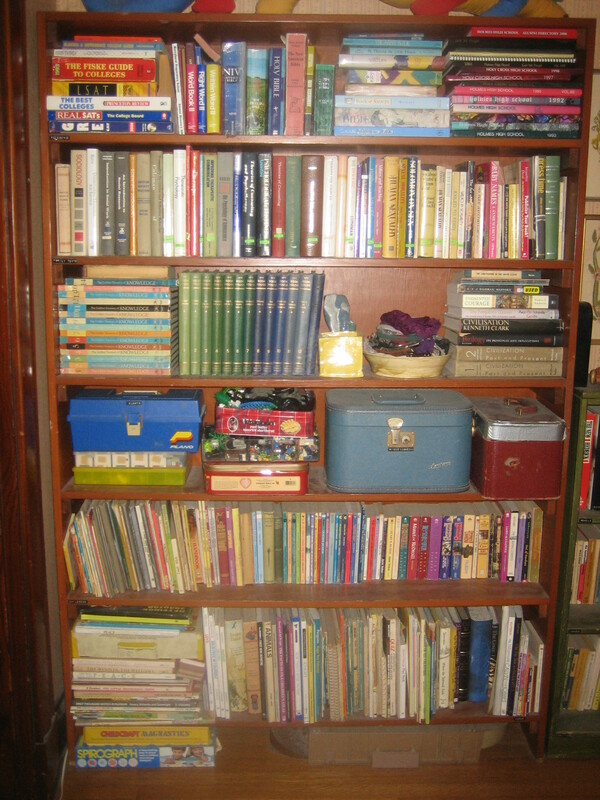 What I AM getting rid of, however, are catalogs. I threw away 10 outdated ones. One way to decrease clutter and paper is to reduce the number of unwanted catalogs coming into the home. See www.catalogchoice.org for help. When I feel braver, I’ll tackle the books. Update: Read How Giving Away 1,000 Books Made Me Love Reading Again for inspiration. #1 | Written by Susan Vogt about 7 years ago. Dear Susan, Yes, giving away stuff not only gives one the self-satisfaction of clearing out clutter from one’s environment, but also the awareness that you’ve helped someone else – perhaps someone you may never meet. In a sense we get more (satisfaction) than we gave. #2 | Written by Susan about 7 years ago. I started a simplifying project this summer, both at home and in my classroom. It is amazing how much peace and relief I feel walking into a room and seeing less clutter ( and taking less than several frustrating hours trying to find something that you know is there). It is still a process but I have enjoyed the smiles of appreciation when I gift or donate items that have been just filling space in my classroom or home. #3 | Written by Viki about 9 years ago. I did no spring cleaning last year because I suffered a severe concussion on St. Patrick’s Day (no alcohol involved). This year, we had an exchange student staying with us in February, so I had no choice but to power purge. It will help our taxes (itsdeductibleonline.com), and lighter the load. Paper gets purged first, with most being recycled and books being donated/sold. Next come clothes: every time we buy something new, we have to get rid of an equal/greater amount of clothes. I even won a contest on Facebook about what I’m giving up for Lent. The answer was “nothing, but…” I decided to stop focusing on an arbitrary “denial” and instead reach outside myself. Hence the donating, plus consciously reaching out to others, especially my daughter’s best friend, whose father died suddenly a couple weeks ago. So does a friend who just had cancer surgery, and another whose 10 year relationship is over. Sometimes giving feels like denial, because we’re denying ourselves the attention we always feel we deserve! The truth is, someone else always needs it more.